10’ x 10’ shaded advertising canopy tent, how better to announce your sponsorship at an event or mark your team’s location at a race or kids sporting event? Portable and custom designed quickly with our online editor. Custom designed canopy pop-up tents are a great tool to keep team members shaded at sporting events or staff members cool while promoting the event. Our easy to use online designer allows you to create beautiful graphics that cover the entire top canopy. With the ability to create design elements for each quadrant or the entire tent, your creative expression is limitless. 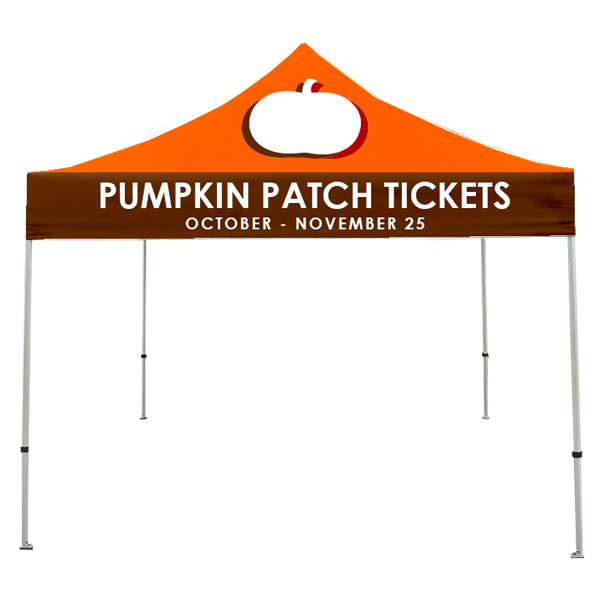 Ideal for farmer’s markets, sporting events, youth sports, fund raisers or community events; place your business phone number, name, or website along the lower portion of the tent and your logo and brand message in the middle. Creating your custom 10' x 10' canopy tent is easy. Start with a selecting how many sides you want to design. Selecting a single side will provide a design canvas for one side which we'll repeat on all 4 sides. If you select two sides, we'll alternate the designs. Selecting four sides will allow you to create a unique message for each side. Please refer to the sample images below for a graphical explanation.